We have a huge number of shower trays on offer on our website, over 150 in fact and it is now possible for you to design and build your own shower to exactly the style to suit your particular requirements. 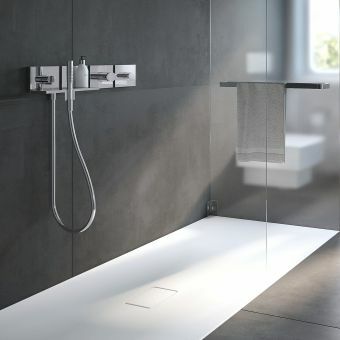 The evolution of shower trays has traditionally been slow, but the 21st century has seen a revolution in the materials used and the quality and performance of shower trays. In Victorian times baths evolved into shower baths, but it wasn’t until just before the second world war when manufacturers of thin gauge steel baths conceptualised the shower tray. The early trays were quite deep and small. The waste technology was not advanced enough to remove the water from the tray fast enough so a deeper tray was able to collect the water and let it drain more slowly. 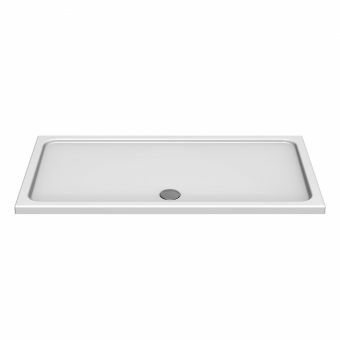 There was little demand and due to the production cost of steel enamel shower trays were very expensive. The concept though was born and due to the ease of showering rather than filling a bath demand grew rapidly through the middle of the 20th Century. 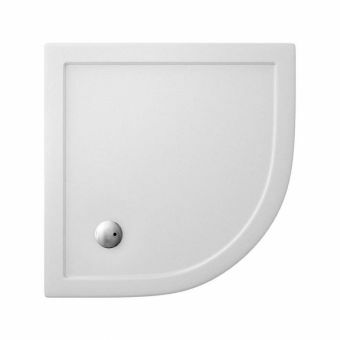 What are the different shape Shower Trays available? 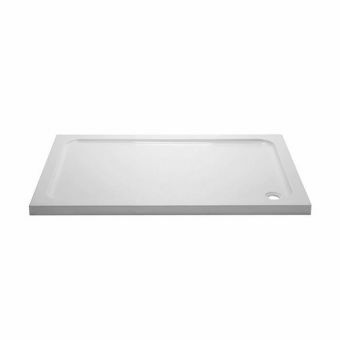 Square shower trays are not as popular as they once were. A square tray is great if you want a small tray, tucked away in a corner. 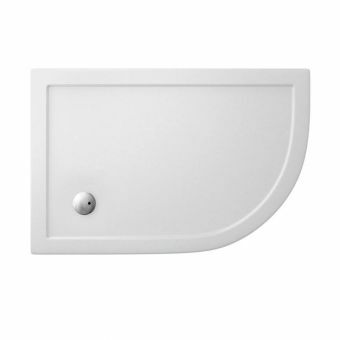 They are perfect for ensuites and cloakroom bathrooms, they are normally used in conjunction with hinged/pivoted shower doors or bi-fold shower doors. 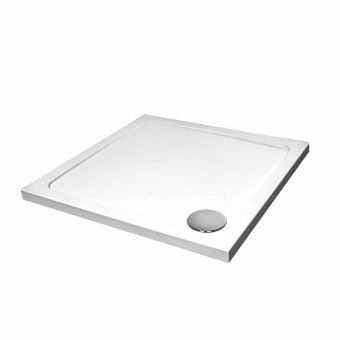 Generally, you see square shower trays smaller than 1200mm going down to around 760 x 760mm. Rectangular Trays are perfect when you have a bit more space to play with. You can either use them with a normal larger enclosure like a sliding shower enclosure or you could use them as part of a walk in shower enclosure with either a predetermined pack such as those offered by Matki or you can design your own using similar solutions to the Kudos Ultimate2 Panels. 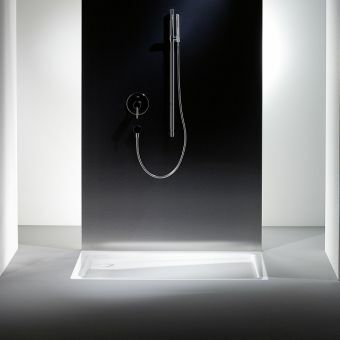 Until very recently, the Quadrant Shower was the most popular UK shower shape. Now we are seeing more and more walk-ins and wetrooms reflecting tastes in the international market, but saying that quadrants are still in high demand in the UK. Statistically, in the UK we don’t have the largest of homes per square foot, and we don’t have the largest bathrooms as a result. As space is at a premium, a quadrant or an offset quadrant could be the perfect ways to maximise the space you have and get the best from your bathroom. 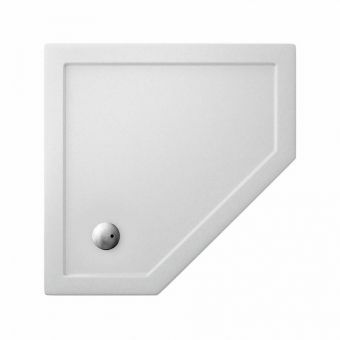 Like the Quadrant Tray and the Offset Quadrant Tray, the Pentagonal Tray is also a great way of maximising space. It’s not a common as the Quads and there is not the same breadth of variations available but they can be a more aesthetic option. By a long way, our bestselling enclosure is the Matki New Illusion Quintesse Shower Enclosure and it's easy to see why! Which Shower Trays are the Best? 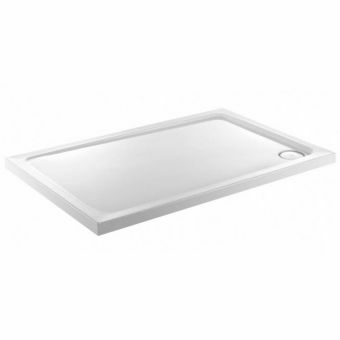 All of our shower trays are sourced from the leading brands and manufacturers in the industry. We select who we work with and we only offer trays on the site that we would be happy to have in our own homes. When we recommend a tray it has to have our full confidence that it is going to work for you and it’s going to last. If water gets loose in your bathroom it can cause havoc, havoc that will cost you a lot to rectify. 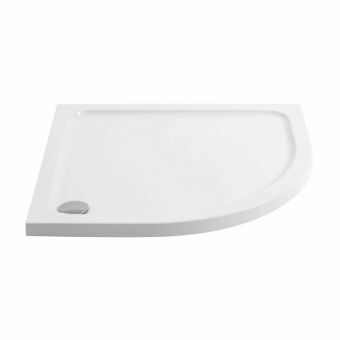 We want to give you peace of mind that a tray you purchase from UK Bathrooms is going to last you a long time. What are Shower Trays made of? 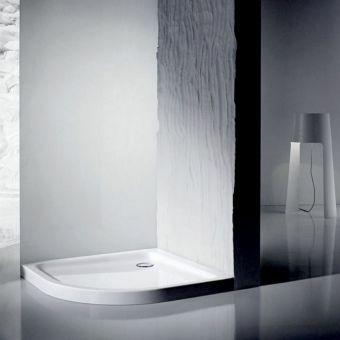 Not only do showers come in a multitude of different sizes they are also made from different materials. It can be easy to get lost in all the options available so we will go through the different types of materials starting with the most popular and work down. Stone-resin is a tough composite material made from combining ground stone /minerals and an adhesive to bind the two together to make a very strong composite structure (just ask our warehouse who have to carry them!). 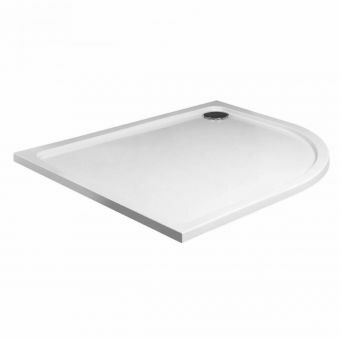 Acrylic-capped Stone Resin Trays are very heavy and durable, but they have the same finish as a normal Acrylic Shower Tray. These trays are perfect for use between joists to give you confidence that the tray is not going to bow or flex. When these trays are in place they really are going nowhere. As we've described, stone-resin is a very tough, solid material. Some manufacturers produce pure stone resin trays with no outer skin, these have a naturally slip-resistant surface that is very pleasant and natural feeling underfoot. A solid one piece they are also very attractive and can complete your new minimal walk-in shower design expectations beautifully. Poured into a mould and cast as a single piece they have a lovely smooth stone finish. 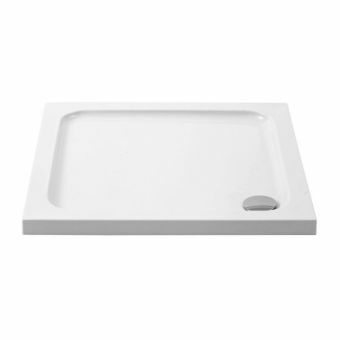 An Acrylic Shower Tray has the same sort of finish as the Stone resin but it is very light. Depending on the manufacturer will dictate the thickness of the Acrylic that is used. All the manufacturers we supply make a tray that is safe for normal use, there is no chance of the tray snapping or cracking but if there is no direct support below the tray you are likely to feel the tray flex and bow when weight is applied. 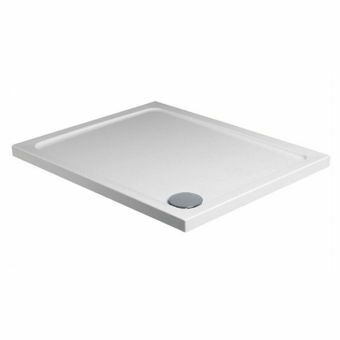 These trays are great for ground floor installations where they are sitting on a solid floor, then you do not have to worry about the tray moving at all. 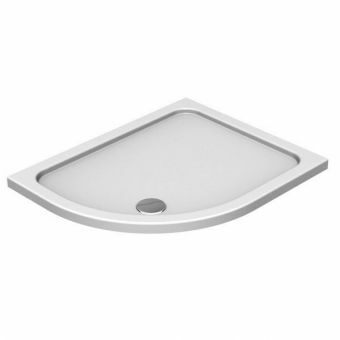 Steel Shower Trays are very popular in Europe, in particular, Germany, which explains why the two leading manufacturers of Steel Enamel Shower Trays Bette & Kaldewei are both German. 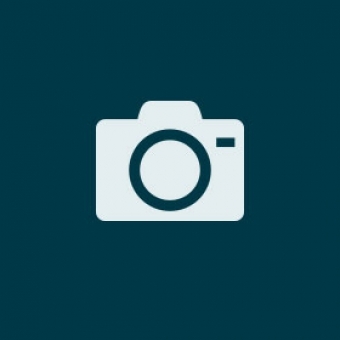 Steal enamel is essentially a combination of steel and glass. Steel gives it a superior structural support throughout the tray, so you do not have to worry about the tray moving at all. The enamel coating on the tray is harder wearing and more resilient than its acrylic counterpart as it is very hard to scratch or damage. Due to the resilience and how the trays are manufactured, you will find that the steel trays will give you more size options, especially on the larger end of the sizes. 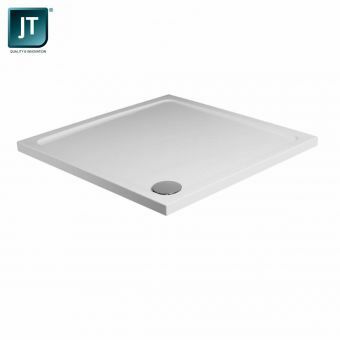 If you need a truly massive tray, then you are looking for a Steel Enamel Tray. What Size of Shower Tray? That is the million pound question. You and your fitter will need to determine what size of tray and enclosure you will need. We can advise you on what works together but really as we are not there on site our advice cannot be too specific to your situation. You will generally find that the shower tray is just wider than the enclosure you are purchasing, as you normally tile onto the tray slightly. It’s not always possible but if you have removed your original bathroom and you are planning your new bathroom, we recommend drawing out on the floor where all the items you are going. So you can have a real sense of how much room you have and how it will feel once everything is. You can then adjust your designs to suit as there is nothing worse than thinking you have plenty of room to play with and you end up with a claustrophobic room. 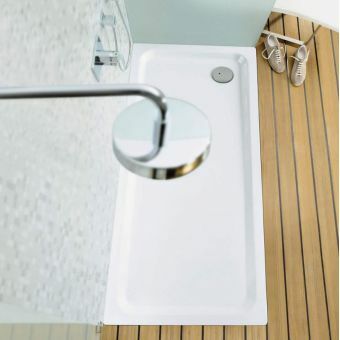 Traditionally shower trays were 80mm+ high and very deep. They were almost like mini baths! Which when you think back to how shower trays we invented they were born from the concept of a bath shower. The main reason for the depth of the trays was down to how the water was removed from the tray. The standard waste size of the deeper trays were about 50mm. The 50mm wastes struggled to remove water quicker than it was filling up, so the deeper tray would allow water to pool inside it until the backlog of water was removed. 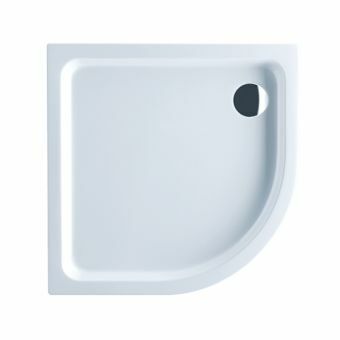 A modern tray is from about 25mm to 40mm in height. They are almost flat, and some of these trays can be recessed into the floor for a flush fitting. They have very little depth, if any. 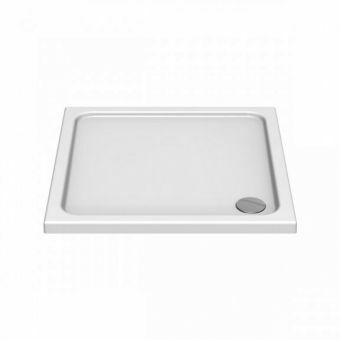 They all use a 90mm fast flow vortex waste which means the water is cleared as soon as it lands on the tray. Even with some of the massive German shower heads that feel more like a torrent of water, it is no problem for the larger wastes. If you take anything from this guide take this, shower tray upstands are just worth the money. We cannot understand why they are not more popular. The upstand itself is a lip on the rim of the shower tray. The tray sits against the wall, the lip then sits against the wall. You then tile against the wall and the lip making an invisible seal that means that even if the silicone at the bottom of the tiles that connect to the tray fails water cannot escape into your floor and cause massive structural damage. If you didn’t want the upstands built into the tray then you can buy sealing strips like the Origins Aquastrap Shower Seal which is suitable for most trays. How are Shower Trays made? How Trays are manufactured really comes down to the materials that are used. Acrylic trays are moulded against a template. They are heated to high temperatures and pushed into the correct shape. Resin trays are poured into a mould and set. Where are steel enamel trays have a metal frame and then the enamel is set on the tray in a mould and fired in a furnace. How to install shower trays? We would always recommend using an experienced professional bathroom fitter. It’s always best to get them out at the planning stage as they will have insights into the workings of your bathroom you might not be aware of. If you are competent at DIY then there is nothing stopping you from doing the installation yourself. Each tray we provide will come with comprehensive fitting instructions. Just don’t forget your tray will be a little wider than your enclosure. How to clean a shower tray? Stay away from chemicals! Modern bathrooms and abrasive substances just do not mix. You might have seen on TV cleaning products that say they can blitz the entire bathroom. If it's an abrasive substance then it will tarnish the chrome on the waste and any other chrome in your bathrooms (and let’s face it 90% of taps and accessories in the bathroom are now chrome). So be very careful with what you need. However, if the bathroom is in a terrible state then it might be a necessary evil. We recommend regular maintenance of your bathroom to avoid the build-up of dirt. Manufacturers recommend you rinse down the shower after use, but that is not always practical especially if you have got children and teenagers where it’s hard enough to get them in the shower in the first place. A regular rinse of the shower tray and removing any hair build up on the waste will keep it in the best condition. If you have problems with limescale then lemon juice and white wine vinegar will cut through any build-ups. For particularly difficult soap build-ups, for when you need an extra kick we would recommend using baking soda with lemon juice. This should get rid of those unsightly soap build-ups. If your seals start to develop back spots then it might be worth looking at using tea tree or anti-mould spray on it to bring it back to new. Are shower trays non slip? Not as standard but most trays you will have no issue with slipping and sliding. Acrylic and Stone Resin trays do not typically come as Anti-slip and really that would account for the majority of the trays we sell every day. You can order trays with Anti-slip properties; they generally take a little longer as they are made to order. You can make a tray retrospectively non slip by using products such as the Origins Anti Slip Coating. The Origins Anti Slip Coating is a silicone gel pad that sticks to the bottom of the tray and aids grip when wet. Wetrooms and walk-in showers are growing in popularity as many households are choosing to remove their cumbersome baths and swap it’s for a more minimal wetroom or walk-in shower. Not only does it free up the sense of space in your bathroom, from an accessibility point of view the walk in or wet room just makes sense. The UK population is getting on older and living longer, as an ageing population accessibility and movement become a real consideration. Lowering yourself in and out of a bath can be a real challenge for some. 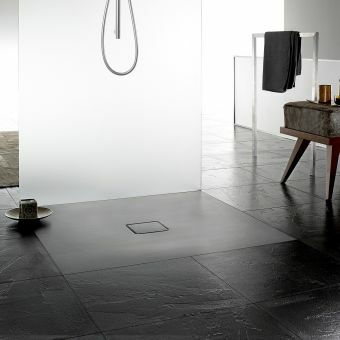 Having a Wetroom or Walkin Shower means that you can easily get in and out whilst retaining a sense of independence. Can Shower trays be made to measure? Some manufacturers do offer a bespoke service. Give our sales team a ring and we can discuss your requirements in greater detail.